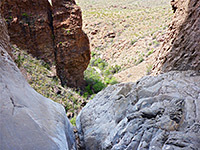 The Window Trail is the most popular hiking route in the Chisos Mountains, and possibly in the whole of Big Bend National Park, especially during the long, hot summer months when conditions in the desert lowlands are generally too extreme for extended walks. 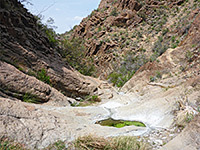 The trail starts on the floor of Chisos Basin and follows the upper portion of Oak Creek Canyon downstream for 2 miles, to the point where the seasonal creek falls away vertically by 220 feet, at the west edge of the mountains. The gradient is gentle, the route wide, much used and generally easy, with just a few rockier sections towards the lower end. 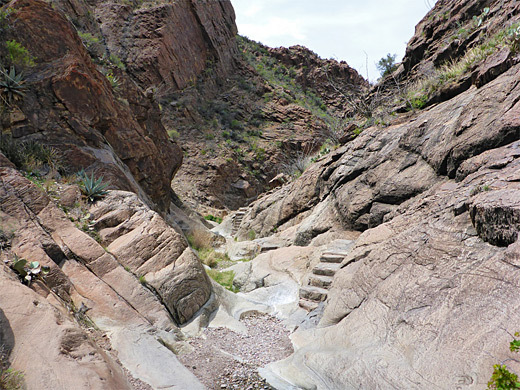 The canyon becomes increasingly overgrown downstream, and the trail passes a good variety of vegetation plus some jagged rock formations; the best part is the 700 foot section just before the pour-off, as here the ravine is narrow and the creek flows over smooth, light grey rocks, forming pools and little cascades. Deer are often spotted in the surrounding woods, while other wildlife that may be present include mountain lions, black bears, javelinas and many species of butterflies. 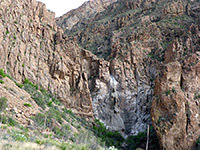 Big Bend National Park location map. 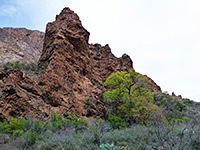 The hike to the Window can begin from the main parking area in front of the Chisos Basin visitor center, a facility which often fills up by mid morning, but a closer start point is either at the group camp or the main camp, along a short side road to the north. Vehicles should be left at the overflow parking area, just before the turn-off for the first camp. This location always has spaces available. From the overflow parking area, the Window Trail may be accessed either by walking further along the road to the far side of the group camp, or, more usually, along the entrance road to the main campground, to a trailhead near the north edge (beside site #52). The path from here crosses a minor drainage and heads due west, descending a little across bushy ground, and meeting the other spur, from the group camp (and the visitor center). 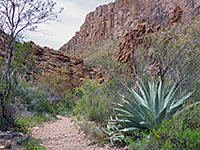 The next section, even wider, continues gently down to the floor of the wide, bushy valley of Oak Creek, where plants include big agave havardiana and clumps of opuntia, plus a few smaller species of cactus. The surroundings are open at first, later more overgrown, as the trail approaches the usually dry creekbed. The slopes on either side rise by nearly 2,000 feet - steeply to the north, up to Vernon Bailey Peak, and more gently to the south. 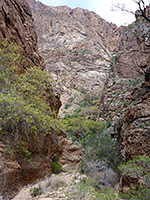 The ravine gradually becomes more enclosed, and the creek is bordered in some places by photogenic, reddish-brown, igneous outcrops (from the Ward Mountain Pluton), with a crumbly surface texture, and rising a little way above the green-leafed trees and shrubs. The trail passes a succession of these spurs, mostly on the south side, while descending a bit more steeply. 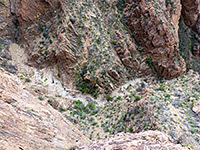 In one place the cliffs enclose the drainage on both sides as the ravine bends to the north, creating a brief sheer-walled, slot-like passage, soon after which the path arrives at a junction - the 1.5 mile Oak Spring Trail forks off to the right, climbing to a ridge then descending steeply down the west side of the Chisos Mountains, and meeting another path, to Cattail Falls. 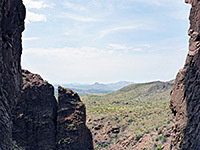 The first quarter of a mile of this trail is enough for spectacular views, of the mountains, the desert, and the lower end of Oak Creek Canyon. The Window Trail continues right along the streambed, which is now quite densely filled with flowering shrubs such as white honeysuckle and Texas mountain laurel - water is usually flowing in this section, hence the growth is more. 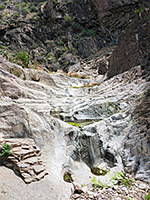 The vegetation stops abruptly at the start of the lower narrows section, where the rocks along the streambed are polished smooth by occasional floods, and the seasonal creek forms shallow pools and small cascades. Steps assist the path down some minor dryfalls and on towards the final big drop-off, framed by dark brown cliffs. 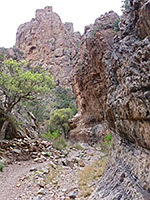 The view ahead is of a projecting section of the cliffs to one side, and open, Chihuahuan Desert flats to the other, where the course of the lower section of the Oak Spring Trail can be seen. This location is a favorite place for watching the sunset, framed by the huge cliffs. The pools develop a covering of dark green algae when the flow rate is low, adding to the colorful scene.